manually or by using a software. Web scraping is used for contact scraping, to gather real estate listings, to monitor online price changes, for weather data monitoring, website change detection, product review scraping, tracking online reputation, Web data integration, Web mash up and research. Web scraping a Web page involves fetching it and extracting it. Fetching the page is done by downloading it. Web crawling is done to fetch pages for Web scraping. After fetching the Web page, the content of the page is parsed, searched and thedata is reformatted and copied. The pages are Web crawled regularly, so that, new pages are fetched for later processing. 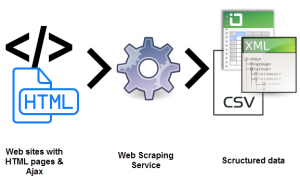 Web scraping services can Web crawl, extract, monitor and refine the fetched data. They then convert the data into a ready to use form. Web scraping services use high end technologies and makes outsourcing, a better option for most of the companies. A Web scraper is an Application Programming Interface (API) to extract data from a website. Application Programming Interface are a set of subroutine definitions, communication protocols and rules for building a software. Since Web pages are built of text based mark-up language like HTML, and contain useful data in text form, the Web scraping service creates a mechanism to get the HTML code. The DOM structures of the website are then monitored to identify the nodes containing target data. After the identification of the nodes containing target data, a node processor is created to output the data in a normalized format. The node processor can be changed in accordance to the client’s requirements and data processing preferences. The system receives an URL at the input and outputs normalized data. Based on the URL, the server decides which reader should process it, prioritizing the highest quality reader with proper customization. In the absence of a priority reader, the URL is forwarded to a default reader, which is either the most stable reader or a third party device. There is also a feedback support, implemented by the Web scraping server to promptly receive complaints if there is any low quality content. This is performed to ensure the high quality of the content. Newer forms of Web scraping involves listening to data feeds from Web servers. Web scraping services are used to extract information from websites.